In the pub or around the table social groups all over the country debate the issues of the day and come up with surprisingly simple and obvious solutions. 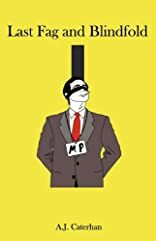 This book rants and raves its way through political minefields in just the same way as a bunch of people in the pub would do. Grammatically it's inept and is totally devoid of any sensible punctuation. It is a straight talking no nonsense review by the people for the people and if it were written by a political party it would have a very different title it would be called "A MANIFESTO". Read it digest it and then take part in it. About Alan J Caterhan (Author) : Alan J Caterhan is a published author. A published credit of Alan J Caterhan is Last Fag and Blindfold.